A whir, a pop, and then the head explodes. Ceases to exist, really. Ropy tendrils of gray-black goop spiral outwards from the point where the head used to be, and then the body falls heavily to the ground. There's precious little time to think about what I just saw, because another enemy is headed my way. Making orcs' heads explode is the soggy climax of one of the first finishing moves I remember acquiring in Middle-Earth: Shadow of Mordor. The gratuity of its imagery complements how satisfying it feels to pull off—especially in the middle of close-quarter combat against a seemingly endless sea of foes. See, I discovered I could make orcs' heads vanish with the clench of Talion's fist shortly after I unlocked an ability to stun bad guys by vaulting over them. This turned Mordor's standard dodge move into a deadly offensive ability as well as a defensive maneuver. But only if it's done right. With the new dodge-and-stun combo, I can leap over a burly opponent with the press of the x button and watch as Talion gives him a swift kick that turned the monster bright blue for a moment, leaving him to shake his head in a dazed state. That's the signal to strike. Provided I have enough of an opening, I'll go in for the kill—slashing at the stunned orc in rapid-fire succession. 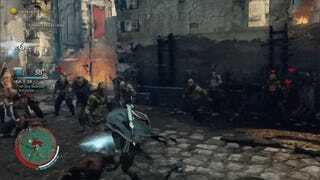 As the attack revs up in speed, Talion's sword starts to make an alien gulping sound with every strike. A strong hum swells up over the course of a few seconds, until finally the camera zooms in for a close up of the two opponents. Talion places his fist just below the skull of the enemy he's been pummeling. A low rumble, and then the moist pop. I've performed this attack countless times. No matter how many times I do it, however, it still makes me jump. And not just me, either: part of the reason it's an effective technique is that its ferocity shocks nearby combatants. They all take a step back away, stunned by what they just saw. How could they not be? One of their comrades' heads just erupted into...nothingness. Mordor's head-exploding animation reminds me of a moment early in Cormac McCarthy's novel Blood Meridian when one of the main characters tests out a "huge pistol" by firing it at a stray cat. "The explosion in that dead silence was enormous," McCarthy writes. "The cat simply disappeared. There was no blood or cry, it just vanished." Both stories emphasize how totalizing violence is for the characters within. Brute force is a tool that overwhelms anything that comes before it, to the point where acts of aggression don't just kill another living thing, they remove their targets from existence entirely. Obviously, there are differences between the two scenes: beginning with the level of gore in each. But in comparison to the rich tapestry of most Lord of the Rings fiction, Shadow of Mordor often feels like it has more in common with an oppressively bleak and violent story like Blood Meridian than it does with Tolkien's original work—or much of what's sprung from it. 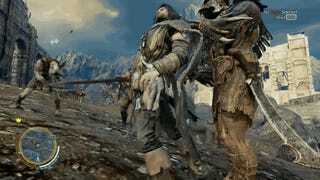 Does that make Shadow of Mordor a more narrowly limited story than some of its relatives? Maybe. But that doesn't change the fact that certain stories need to be violent, and excessively so, if they're to be told properly. Comparing Mordor to Peter Jackon's film trilogy, for instance, makes the game seem sparse and claustrophobically aggressive. There are no tranquil scenes with hobbits going about their business in this story, no animate trees waxing poetic about the magic of the forest, no lembas bread to savor. 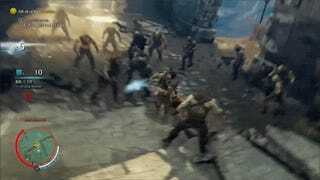 Just one human and many more orcs, all trying to kill each other every step of the way. But I think Mordor succeeds because of these very limitations. It's a game that only knows the language of violence. It's exceedingly fluent in that language. Like the best violent video games, it uses its gore with exceptional grace and purpose. There's one moment in Peter Jackson's third Lord of the Rings film, Return of the King, that's always stood out to me—especially now, in light of Shadow of Mordor. It's at the beginning of the battle for Gondor, when Pippin wanders over to the ramparts and Gandalf rushes to defend him. In the process, the wizard lands a massive blow with his sword on an orc's chest. And the orc just...falls over. No blood. No writhing around in pain. Nothing. Gandalf could have just as easily hit the orc with a wooden plank, rather than a broadsword. Maybe that's technically how a blow like that would have gone over in the real world. But for whatever reason, after I saw that, it made me reconsider Jackson's entire trilogy. For an epic saga that gives a ton of screen-time to humans and their human-like allies waging all-out war against gross-looking monsters sprung from the most scary places imaginable, the vast majority of its combat feels strangely bloodless. I know that it's a story about good triumphing over evil, and a core part of that triumph comes from the fact that the main characters never let go of their ideals no matter how tough the going gets. But still: is it that crazy to expect that Gandalf the White's robe gets a little...dirty in the process? Ok, you get the idea. Crazy, right? But that's the point. Talion is one man facing off against endless waves of bad guys behind enemy lines. He's a soldier by nature. He doesn't need to wait for someone else to sow chaos in order to pass through Mordor, like Frodo and Sam do in their journey. He brings about chaos himself. Mordor isn't just a violent game. It's also the kind of game that unequivocally enjoys its violence. There are few, if any, moments in Mordor's storyline that encourage either the player or Talion to own up to all the horrible stuff he's doing to his opponents. If anything, the game invites its players to relish the punishments they're inflicting upon the orcs. At one point early in the campaign, for instance, Talion is assigned a mission that involves poisoning an entire orc encampment by sneaking around and slipping toxic ingredients into their grog. Talion responds to the directive with a quip about how much he'll enjoy seeing the end result. Spoiler alert: it's pretty gross. Am I, the player, supposed to feel gross in turn? Mordor stands out to me as I play it because it seems so...unconcerned with the implications of all its blood and gore. There are no BioShock-like moments where the game turns itself on its head to reveal that all the orc-killing was done with a misguided sense of purpose. No Spec Ops: The Line-esque loading screens that ask you "How many orcs have you killed today?" Even if there were, it'd probably be a way to egg you on to go and kill more. I appreciate that Shadow of Mordor celebrates its own excess, however. The game takes an unflinching look at its own conception of combat, one that refuses to shy away from the baser instincts that warfare gives rise to. And make no mistake: warfare is what's unfolding in Mordor. It might not be at the same epic scale as The Two Towers or Return of the King, but the game makes its moral standards clear from the outset. The orcs are the bad guys here, because they're servants of the villains in Mordor. If they have any redeeming qualities, it's that they're occasionally petty and self-interested rather than devoutly loyal to Sauron and his inner circle. Like the best violent video games, it uses its gore with exceptional grace and purpose. It's important to emphasize the core evilness of Mordor's orcs, even in comparison to other pieces of Lord of the Rings fiction, because otherwise I'm not sure the game's hyperbole would sit so well with me. It certainly hasn't with others. Writing for The Verge, Chris Plante bemoaned Shadow of Mordor's "morally repulsive" obsession with punishing orcs: "This is a video game about a spurned man terrorizing an entire foreign culture, literally killing, branding, torturing and enslaving hundreds of living beings." I don't accept Plante's characterization, because I don't think it's what players are meant to see in Mordor's orc community. This is a game about going behind enemy lines. At most, the areas you're infiltrating are militarized outposts populated entirely by bad guys. Passing by an orc patrol undetected, I often heard orcs whining to one another by saying things like "Why do slaves always beg for their lives?" or, "It's been a day since I cut someone's head off!" Mordor's higher-level opponents, meanwhile, come at you with a mixture of menace and boyish humor. They have names like Kaka Giggles and Skoth the Dumb. They taunt with you hilariously blunt proclamations like, "Now I inflict the pain!" That is: until you manage to beat them back. And then they beg for mercy with silly quips like: "Don't kill me! I would die from that!" If this is a veritable "foreign culture," it's one entirely made up of locker room bullies and aspiring pro wrestlers. There's something refreshing about visiting a world like Mordor's—one where good and evil are so clearly separated that you can always tell whether someone is a friend or foe by simply assessing the quality of his teeth. As we observed last week, Shadow of Mordor is cut from a similar cloth as the Batman: Arkham series in this regard. 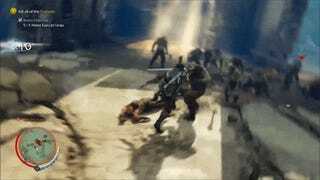 Talion attacks his enemies with an identical rhythm and meter as Batman does in those games. But much like Gandalf in Return of the King, Batman's aggression and high-mindedness don't always mix well together. As the critic Tom Bissell pointed out in an essay about Arkham City: "punching someone in the spine as hard as you are capable of punching someone does not strike me as the modus operandi of a man with any particular interest in preserving human life." The fighting in Mordor feels just as visceral and rewarding as it does in the Arkham games. But just being able to see blood spurt out of all the bad guys I'm pounding away at makes the Lord of the Rings counterpart ring more true—to its gameplay, if not its lore. I'm not much of a Batman fan, after all, but the guy's moralism has always struck me as a nifty way to explain why his archrivals keep coming back to challenge him again and again. Your enemies do that in Shadow of Mordor, too, thanks to the weird way that Talion and his enemies' immortality breaks the game's fourth wall. But if nothing else, I love that this game has enough courage in its convictions to accept that Talion is using a sword to mete out his punishments, and make those punishments feel appropriately bloody in turn. "Now I inflict the pain!" one boss might shout. On its own, that might sound self-serious and scary. But then there's always another orc just around the corner. One of my personal favorites has always reminded me of my missteps: "I've lived a long time," he might say. "You've lived many times. That tells me one of us is careless enough to die." It's a threat, sure. But it's also an invitation to get back up off the ground and try again. Because at the end of the day, I think these orcs just want to have fun with you. And fun is what Shadow of Mordor is, above anything else.